The Honister Pass is a mountain pass located on the B5289 road linking Seatoller in the valley of Borrowdale to Gatesgarth at the southern end of Buttermere. The pass at 356m (1,167ft) with gradients of 1-in-4 (25%) is one of the highest and steepest in the Lake District. Honister Pass is one of four passes in the Lakes, the other three being Whinlatter Pass, Newlands Pass and Kirkstone Pass. The Honister Slate Mine and Honister Hause Youth Hostel are located at the summit of the pass known as Honister Hause. The footpaths at the summit lead to Fleetwith Pike, Grey Knotts and Dale Head. Honister Slate Mine producing the world famous Westmorland Green Slate is the last working slate mine in the UK. Owned by a local family it is open to the public from 9am to 5pm 7days a week. The mine with a large car park has a visitor centre, shop, cafe, underground tours of the workings and England’s first Via Ferrata, where participants use a safety harness to scale a cliff path. Quarrying for the Westmorland green slate has taken place in the area since 1728. Opencast quarrying had been carried out at Honister since the late 17th century but as capacity increased the site’s underground workings were extensively expanded by 1870. Production reached 3,000 tons a year by 1891 and more than 100 men were employed. The mines reverted to care and maintenance for a while due to labour shortages in the First World War. By 1926 following a change of management and a new Resident Director production increased and modifications were undertaken throughout the quarries, such as the works at The Hause being electrified with two Ruston 4-cylinder diesel generators. Despite an enforced closure from 1943 to 1945 during the Second World War production continued through the 1950s and 1960s. In 1981 after fifteen years of poor management all the quarries of Buttermere & Westmorland Green Slate Co. Ltd were acquired by B R Moore and his father RD Moore who introduced a programme of improvement and a large amount of capital was undertaken. This included the installation of rail-borne EIM-Co Rockershovels, battery locomotives, improved rolling stock and increased specialist underground mechanisation and systems. In 1985 the Moore’s sold the company to Alfred McAlpine plc who then ceased operations at all quarries in 1989. Only care and maintenance was undertaken. In 1997 the mine was reopened by local businessman Mark Weir who redeveloped the mining side producing small quantities of roofing slate and by turning the site into the tourist attraction that it is today. Honister Mine was featured in the 2011 BBC television program ‘Tales from the National Park’ which followed owner Mark and his attempt to open a zip wire from the top of Fleetwith Pike to the mine below. Tragically he died in a helicopter crash during the making of the program. Grey Knotts at 697 metres (2287 feet) rises up from the Honister Slate Mine at Honister Hause and can be seen from mid-Borrowdale. It is part of a ridge which ascends from the woodland behind Seatoller and continues south-west and then south for 2.5 miles to Great Gable. 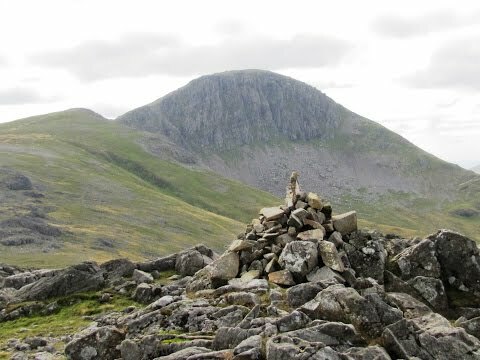 Grey Knotts is a ‘Wainwright’ fell and also qualifies as a Nuttall and walkers often use the fell from Honister Pass for the ascent of Green Gable and Great Gable which gives the advantage of starting at a height of 356 metres (1167 feet). The summit is dotted with grey tors of rock and two of these give the fell twin tops of equal height, the eastern top has an Ordnance Survey trig point. There are also several small tarns as well as some fence posts which are good to assist navigation. From the top Buttermere valley can be seen to the north-west and the Scafell range can be seen standing out to the south. The hill that lies between Grey Knotts and Green Gable is Brandreth. At 715 metres (2,346 feet) the summit is bleak and stony marked by the remains of old fences. The top is identified by a cairn built around a boundary post where the three ridgeline fences meet. Brandreth is mainly walked en-route to Green Gable, Great Gable and Haystacks. Green Gable at 801 metres (2,628 feet) is often walked en-route to its more famous neighbour Great Gable and can be ascended from Seathwaite in Borrowdale or Ennerdale as well as from Honister Pass. It has a neat summit marked by a cairn from which Gable Crag and Great Gable can be admired but the view up the Buttermere valley is outstanding. Great Gable at 899 metres (2,949.5 feet) is one of the most popular fells in the Lakes and appears as a pyramid from Wasdale but as a dome from all other directions. Its summit is strewn with boulders and the highest point marked by a rock commemorating those members of the Fell & Rock Climbing Club who died in World War 1, a memorial service is held here on Remembrance Sunday. The summit has some of the best panoramic views due to its central position within the Lake District and has become a popular site for the scattering of ashes following cremation. A hundred yards to the south-west of the summit, overlooking the Napes, is the Westmorland Cairn which was erected in 1876 by two brothers named Westmorland to mark what they considered to be the finest view in the Lake District. The Napes are important in the history of English rock climbing. W. P. Haskett Smith’s ascent of the remarkable detached pinnacle of Napes Needle in June 1886 is thought by many to mark the origins in England of rock climbing as a sport in its own right, as opposed to a necessary evil undergone by mountaineers on their way to the summit. Napes Needle is now graded Hard Severe and those wishing to climb it should be warned that a safe descent is far more difficult than the ascent as there are no permanent anchors or bolts from which to abseil. Down climbing is the only way to get from the summit to the shoulder and gear on this second pitch is sparse. A relatively simple abseil can be set up to get down from the shoulder. Windy Gap is a high pass at 750 metres (2,460 feet) situated at the bottom of steep stony slopes which links Great Gable to its smaller sister hill, Green Gable. The descent from Windy Gap on the Ennerdale side is Stone Cove while the south-eastern descent leads down Aaron Slack. The lower pass of Beck Head at around 650 metres links Great Gable to its western neighbour Kirk Fell. From the car park take the path behind the slate mine sign posted Grey Knotts. We climb and scramble steeply uphill following the fence line on the right. We pass a stile and at the second stile we cross over and keep following the fence now on our left. At the end of the fence we turn left, we are now on the top of Grey Knotts. We head forwards on the level past some small tarns with the fence line still on our left. We go through a gate and head towards a metal post. We walk across the stony top of Brandreth to the last cairn and keep heading forwards downhill then uphill to the summit of Green Gable. We now make our way very steeply downhill taking care on the scree to the cross roads of paths at the bottom, this is Windy Gap. We now head forwards steeply uphill scrambling over the rocks to the top. We keep following the path which bears left on the level to the summit of Great Gable. We then retrace our steps back to Windy Gap and turn left steeply downhill again taking care on the scree towards the valley. At the cross roads of paths we turn right slightly uphill towards the hill. The path bears right and after crossing over a stream the path bears left onto Moses Trod. We keep heading forwards and when the path splits we turn right to go over a stile in the fence. We head forwards to a track and a cairn. We turn left and follow the track, which bears right then head forward following the cairns to a wall and the old tramway. We turn right and follow the old tramway downhill back to the car park. This is a hard walk on grassy and rocky paths and tracks. Parts of the inclines and declines are very steep and also require some scrambling. Approx 5.5 miles allow 3 – 4 hours using OS Explorer Map OL4, The English Lakes North-western area. Start point: Honister Slate Mine situated at the top of the Honister pass. Honister Slate Mine at Honister Hause situated at the top of Honister Pass between Buttermere and Seatoller in the Lake District, Cumbria. Honister Pass and the Slate Mine can be reached from Keswick or Buttermere. From the A66 coming from the east take the A5271 for Keswick. At the junction turn right. At the traffic lights carry on forward. At the mini roundabout turn left then left again at the junction. At the roundabout go straight over then at the next roundabout turn right and follow this road, the B5289, passing Derwent Water and Grange on the right. Continue on through Rosthwaite and after passing through Seatoller continue to the summit of Honister Pass. The Slate Mine and car park are on the left. From the A66 take the B5292 Braithwaite. On entering Braithwaite take the first left then bear left and follow this road and the signs for Buttermere. On reaching the t-junction at Buttermere turn left following the B5289 road to the far end of Buttermere Lake and Gatesgarth then continue to the summit of Honister Pass. The Slate Mine and car park are on the right. Parking: Honister Slate Mine to the right of the visitors centre £5 per day refundable on mine tours or shop purchases over £10 retail value. Over flow and Wainwright’s Walkers car park on the left of the visitors centre £3.50 per day. There are public toilets and refreshments at the Sky Hi Cafe at Honister Slate Mine.